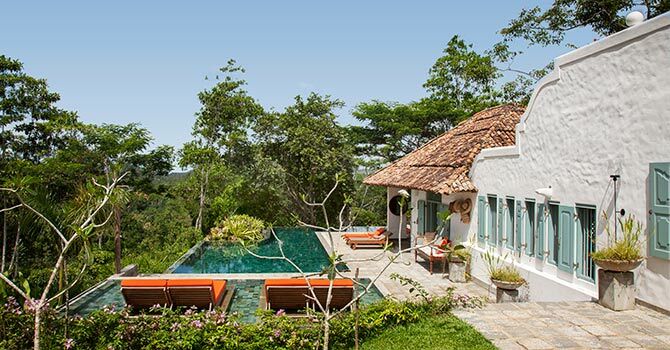 Sisundu Tea Estate Villa is surrounded by natural beauty in southern Sri Lanka, sleeps up to fourteen guests in six bedrooms. 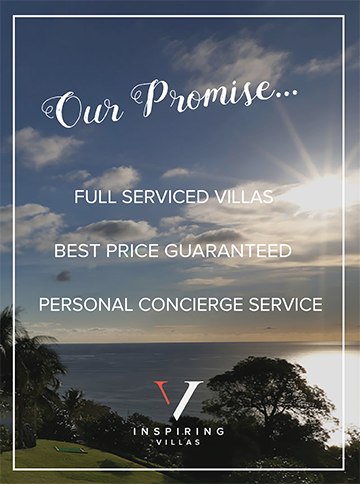 The villa is fully staffed for your comfort and enjoyment. 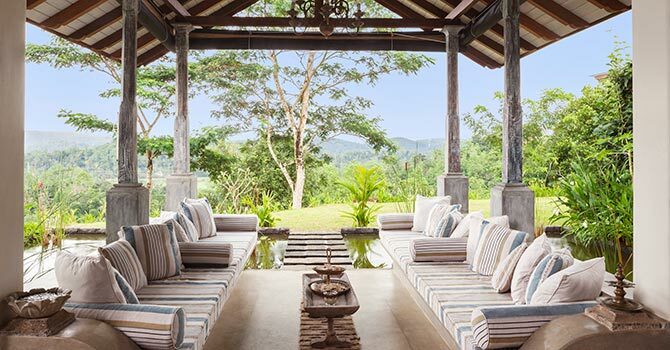 This gorgeous villa is nestled on top of a hill and set amongst an 8 acre tea plantation. It features beautiful shared living areas, including an open-sided living room with three sofas, a sound system and small dining table. It adjoins a terrace that overlooks the garden and jungle. There is also a study and television room, as well as a kitchen that opens up to a large dining room that seat fourteen. Guests may also choose to dine outside in one of the beautiful alfresco spaces, or up on the spacious terrace. 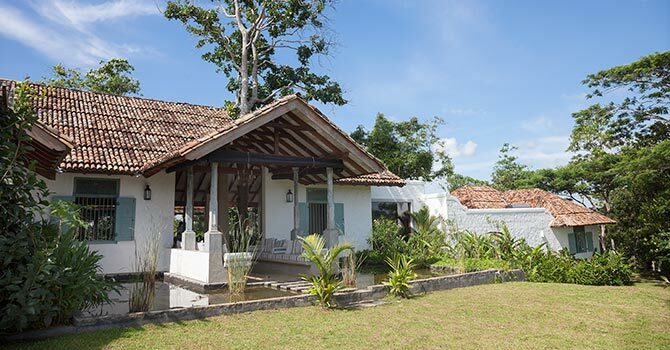 Nestled in the garden, you will also find a peaceful yoga shala, as well as a massage room with two massage tables. 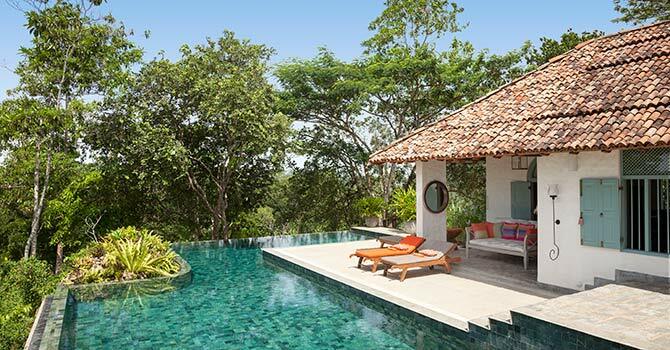 Also in the garden is a stunning infinity pool which is flanked by a pool deck with ten sun lounges. 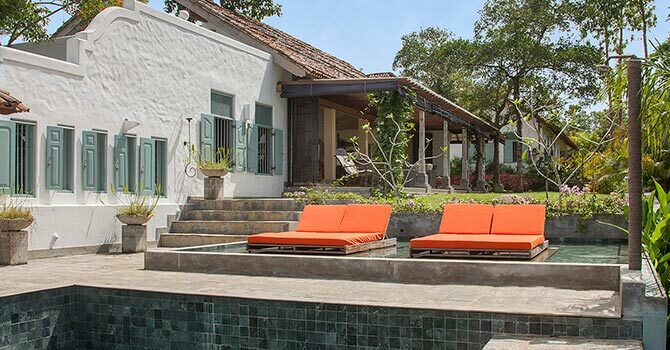 The luxury villa is located in popular Galle, and is perfect for a large group seeking a secluded retreat. There is a restaurant nearby, or allow the staff to prepare one for you in the villa.  All of the restaurants, shops and spas of Galle are a short taxi ride or drive away. The master suite features a king double four-poster bed, separate living space and terrace, as well as a luxurious ensuite that includes a bath as well as two showers, vanity units and toilets. Three further rooms feature king double beds (one with two additional singles, perfect for families), while another has a queen bed and an outdoor bathtub located on the picturesque balcony. There is a further garden room which has two king double four-poster beds, and an ensuite. Good lcoation. The decoration is simple and neat. Congratulations to TEAM SISINDU C. Thank you to SANTA for your constant attention to NUWAN for the quality of its food and its permanent enthusiasm, without forgetting NIMAL who watched over the night. We had a really unprecedented experience.